Cereal and peanut bars, half coated in milk chocolate. 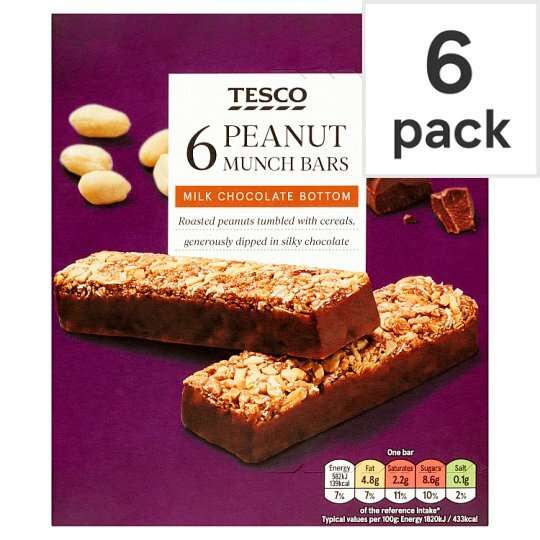 Milk Chocolate Bottom Roasted peanuts tumbled with cereals, generously dipped in chocolate Our partners have been working with cereals for over 15 years. They use their specialist experience to select the best ingredients, creating high quality snacks for you to enjoy. INGREDIENTS: Glucose Syrup, Oat Flakes (21%), Milk Chocolate Coating (17%) [Sugar, Cocoa Butter, Dried Whole Milk, Cocoa Mass, Emulsifiers (Soya Lecithins, Sunflower Lecithins), Vanilla Extract], Wheat Flakes (9%), Crispy Cereals (9%) [Rice Flour, Sugar, Malted Wheat, Dextrose, Wheat Gluten, Rice Starch, Salt], Peanuts (6%), Milk Chocolate (3%) [Sugar, Cocoa Butter, Dried Whole Milk, Cocoa Mass, Flavouring, Emulsifier (Soya Lecithins)], Palm Oil, Stabiliser (Sorbitols), Honey, Flavouring, Emulsifier (Sucrose Esters of Fatty Acids). Also, may contain nuts.. For allergens, including cereals containing gluten, see ingredients in bold. Store in a cool, dry place way from direct sunlight.